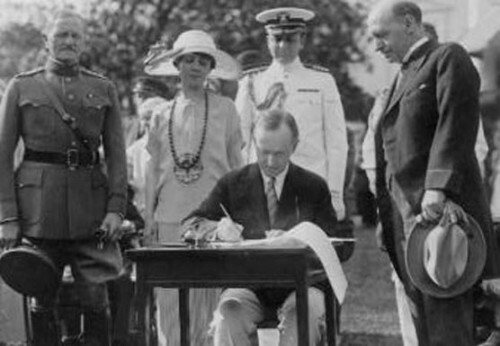 This past May, the policy director of the Madison Project, Daniel Horowitz, took an important look at what Calvin Coolidge thought about immigration. As the pressure is on to overhaul current law on the matter, historical perspective from the man who took time to explain the purpose of restriction and its very real benefits to both Americans and those who want to come here, this short piece merits attention. The President signing the Johnson-Reed Act, on the south lawn of the White House, May 26, 1924. Included in Japanese Immigration by Raymond Leslie Buell. Boston: World Peace Foundation, 1924. Digitized at http://pds.lib.harvard.edu/pds/view/4009420?n=95&s=4&printThumbnails=no.